Wonderful view from the house on the Crete Senesi and the Tuscany countryside. In the heart of Tuscany, surrounded by olives trees the house is part of a renovated old monastery. The house, 95 sqm, is on two floors, with independent entrance, private patio equipped with tables and chairs, vast garden, swimming pool (25 sqm) and an open air jacuzzi (5x5). The flat is equipped with all the comforts and furnished in a typical Tuscany's manner with care and love. At the ground floor there is the kitchen, the living room with the fire-place, the bathroom with shower and a storeroom; at the first floor there is the master bedroom, a double twin size bedroom and the second bathroom with shower. Very calm and quiet and yet closed to many of the most beautiful turist sites in Tuscany. I am a woman in love with Tuscany's countryside, in love with the nature and the peace that this land carries and transmit. I am in love with each and everything that helps us to leave a full and joyful life, in harmony with ourselves and the people around us. The house is in an amazing setting high up with the most beautiful views over the Tuscan countryside. The outside space is very private and peaceful. The house is very traditional comfortable and pretty with enough space for 4 people. Bathrooms are very good clean with good showers. Washing machine and well equipped kitchen is really useful as you are a drive away from restaurants in the local town. It was a pleasure to host you both in my house and I am very glad you enjoyed Palazzo Monaci and The surroundings. A beautiful location, with spectacular views of surrounding countryside. Apartment was clean, well cared for with all that we needed (all linen and towels provided except a tea towel)The two swimming pools are wonderful - again with a glorious view! You'll need a car to explore the wealth of amazing towns and within easy reach of Asciano. Be aware that the agency where you collect the keys are open on Saturday afternoons, after 4pm, despite the notice saying that they are closed! We will recommend this to friends as we have had a wonderful time! I am so glad to have host you in my property. Thank you for being such a wonderful guest. Superbe vue sur Asciano et ses environs, piscine au pas de l'appartement. Résidence très calme, même à la piscine ou il n'y avait du monde qu'à partir de 16h ou la matin dès 9h et jusqu’à 13h. Le seul manque est un local poubelles, ou alors nous n'avons pas vu. Logement bien placé dans la résidence, caché par une petite haie et pas trop passagé, pas de vis a vis avec les voisins. Dans le village, nous avons mangé au restaurant La Mencia, cadre dans un jardin fleuri très agréable, surtout le soir. Repas à un prix très correct et très bon. Comme un peu partout pizza et pates au menu (normal c'est l'Italie). L'agence qui gère les locations est très sympathiques, mais attention aux horaires (à l'italienne pas avant 15h30/16h). We, family of 4 (with older kids), stayed in this very nice place. The views are just amazing. The pool is very nice, it was never too busy, even in high summer. The house is cosy and great, you can easily keep it cool with shutters, it has two nice bathrooms. Everything works perfectly and the house was very clean.The terrace is not to big but nice and still quite private thanks to huge rosemarybushes, the layout of the whole building is well thought about and therefore pleasant. The contact with the owner is also very good and efficient. The surroundings are great and driving to Siena is a treat of beauty.. I'd recommand this place for sure. Wonderful vacation in cosy Apartment! We had a wonderful Time in the Apartment in Asciano - the apartment was well equipped, the Location in general was marvellous, the neighbours (either owners or other travellers) were Kind and very friendly, the communication with our landlord was great and uncomplicated and our son (6) loved the Pool. The only "Problem" was that there were no shadow places around the Pool - a Problem for light skinned people, next Time we would take a parasol with us! We hope to come again and recommend the Place highly. It was a wonderful apartement. everything we needed was available. Two big bedrooms with a wonderful view to the poolside. One big bathroom upstairs and another bathroom downstairs. Absolutely perfect! The view from the pool area is awsome. The two big pools we had nearly for ourself. We (4 adults) had a wonderful time! Take the highway to Florence and then the motorway Siena-Bettolle, exit Asciano. 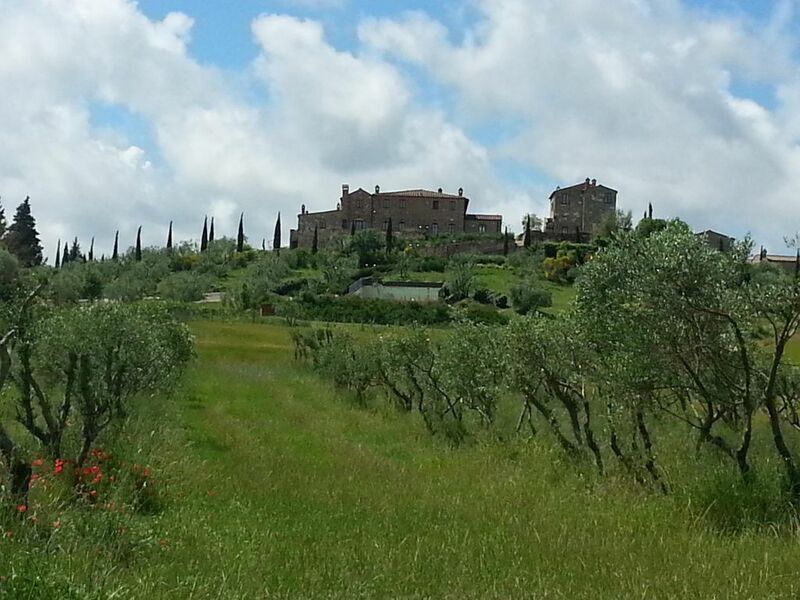 Once in Asciano take the road to Abbazia of Monte Oliveto, direction to Buonconvento. You will pass first the Agriturismo Monacone and then the Agriturismo La Coppa; after 500 m. on the right end side there is a small road and the signage for Palazzo Monaci. There are so many attractions nearby, cultural sites and wellness center: in less than 20 minutes you reach Siena with all its historical monuments. It is the ideal place for a renewing vacation, very closed to the famous Rapolano Terme and a bit further away the Chianciano terme. The area is worldwide well known or the production of DOCG wines (Chianti, Brunello di Montalcino, Vernaccia di San Gimignano) and for the typical characteristic local food specialties (salumi, pecorino cheese etc..). Strategic location to discover the most important artistic cities of Tuscany : Florence, Montalcino, Siena, Volterra, Pisa, Arezzo, Cortona. You will have just to choose which of them to visit end enjoy this beautiful part of Italy.In more or less an hour you reach the Maremma seaside with the stunning beaches of Punta Ala and Castiglione della Pescaia. And do not forget the shopping: if you are interested in Italian brands in 20 minutes you are at the VALDICHIANA OUTLET VILLAGE and in an hour at the exclusive THE MALL in Incisa Val d'Arno. You will have just to choose which of them to visit end enjoy this beautiful part of Italy.